One Room Challenge: Week 6 | Eclectic Modern Farmhouse Guest Room Reveal! PSST! FOLLOW THE ORC SERIES FROM THE BEGINNING: WEEK 1, WEEK 2, WEEK 3, WEEK 4, WEEK 5. Hooray, hooray! It's One Room Challenge reveal day! I am beyond excited to share my brand new "eclectic modern farmhouse" guest room with you. I'm so thrilled with how it turned out, and thank goodness it's done because we have houseguests coming this weekend! There was nothing terribly wrong with it, but it just felt blah, boring, and in need of a little oomph - do you know what I mean? Well, oomph it got! I can't even believe this is the same room. It's now a little oasis for our guests (I hope they love it as much as I do!). Let's go for a tour! 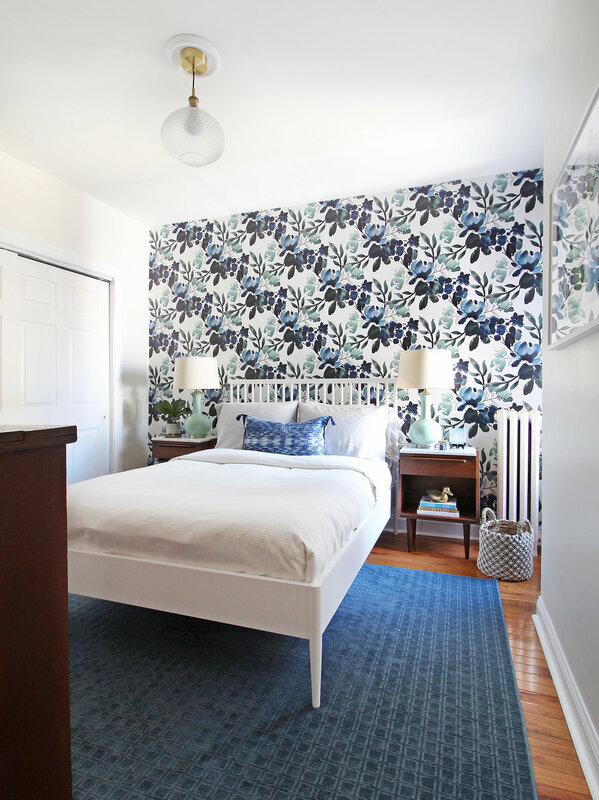 The most obvious change - and the one that was really the inspiration for this entire room transformation - was the addition of that bold, beautiful watercolor floral wallpaper from Sweet Pea Wall Design. Man, I love that wallpaper. I think I stop and stare at it every time I walk past this bedroom. Even though it's a floral, the blues, greens, and grays keep it from being overly feminine. Those three colors happen be favorites of mine in general as well, so using them as the color palette for the room was a no-brainer. As I mentioned in Week 1, this room only has one funny little window tucked back into a nook (it offers a surprisingly good amount of natural light throughout the day). When we moved into this house, I threw up a tension rod with a beige curtain to give folks some privacy and darken the room at night. That was supposed to be a temporary measure, but the next thing I knew, it was 2.5 years later and that same sad curtain was still up there - it was definitely time for a change! I decided on a layered window treatment for this window to give it some serious style and function. I hung a natural woven shade (it's a great one, y'all, and it's super affordable!) and a curtain panel, and the combination of the two is mighty fine if I do say so myself. I DIY'd the curtain panel out of some amazing Vern Yip fabric from Calico and you can read all about that over in Week 4's post. To the right of that window is a nice stretch of wall that was definitely in need of some artwork, and can I be honest with you for a minute? Figuring out what to put here was hard. I didn't want to compete with the floral wallpaper, but I wanted something that was in the same general color palette and overall feel. So what does one do in this situation? Create some art! Here's the quick version of the story behind this piece: one thing I've been trying to do more of in 2018 is paint, and recently I was playing around with an abstract landscape that happened to have the blue/green/gray color palette I was using in this room. I ended up loving the way the paints looked on my palette, so I decided to do something a little crazy: create some digital art out of it! I had it printed in a large format to fill this wall frame and loved how it turned out! It ended up being just what this wall needed. And guess what? I'm going to try something new - I've decided to offer this piece of art to y'all as a digital download so you can have one printed in your own home! You can print it on paper and frame it (I had mine printed at Staples), or even have it printed on ready-to-hang canvas. You can click the button below to head to the purchase page. To celebrate the ORC reveal, I'm offering it for $10 (50% off!) for a limited time, so go grab yours today! To give this side of the room that eclectic modern farmhouse feel I was going for, I hung a black and gold hexagon mirror from Holly & Martin, and added a slim modern leaning ladder on the angled wall next to it. I figure that ladder will be a great place for towels and for guests to hang a few items. It's a small room, so I wanted to take advantage of the vertical space when I had the chance! I styled up the dresser with a few fun items like this set of three little vases from CB2 and a faux plant from Target. I had fun playing around with a bunch of things to get it just right. I love how in the detail shot above you can see the reflection of the wallpaper and the fabulous glass pendant light from Lamps Plus. The light fixture is so simple, yet elegant, and it definitely marries the modern and farmhouse style pieces in the space. Also, it's hard to go wrong with a brass elephant for a little bit of fun on the top of the dresser! Turning back to the bed side of the room, I wanted to point out the new blue rug from Mohawk. I've wanted a rug for this room for forever - it adds a certain coziness and grounds the white modern farmhouse bed really nicely. The simple grid pattern has just enough going on to stand up to the wallpaper behind it, but it doesn't compete. This rug is made out of Mohawk's SmartStrand material, which is virtually indestructible, so I'll never have to worry about spills or stains in this room (read more on that here). Let's talk details about a couple of the other pieces. First up, the nightstands! These vintage babies have gotten a new lease on life thanks to some Carrera marble tops. (You can see what they looked like before here.) They feel so special and custom now - I'm so glad I decided to splurge and have those pieces cut to fit! Here's a shot straight on of the one on the right side. The marble really brightens it up and unites it with the bed and wallpaper. Next up? The indigo lumbar pillow! Back in Week 4, I showed you this pillow I made and posed the question of whether I should add tassels to the corners. Well, just like when I asked about adding marble tops to the nightstands, the answer was a resounding YES! So I headed to the fabric store, grabbed some embroidery thread and made some tassels. I had never done it before, but it was surprisingly easy and quick. They add the perfect bit of personality to this pillow! With that, I'll leave you with a few more shots of the room below, along with a source list for the items in the room if you'd like to get the look for your own home. Some items are vintage or pieces I already had, so I did my best to find some similar ones. Let me know if you have any questions! Thanks SO much for following along on this One Room Challenge journey with me for the past six weeks. I want to give a huge thank you and shout out to the companies that helped make this transformation possible by sponsoring some of the products in this room: Sweet Pea Wall Designs & their sister shop MUSE, Holly & Martin, Lamps Plus, Calico Corners, and Mohawk Flooring. I had a blast with this project, and I'm beyond thrilled with how this guest room turned out. Visitors, come on - we're ready for you! Psst! Want to see more One Room Challenge spaces? Head over here to see the full list of participants! Thanks again to all of these amazing sponsors for their contributions! Welcome to Week 5 of the One Room Challenge! I'm closing in on the finish line - good thing since the big reveal is next week! This week, I'm (finally!) showing you the other side of the room and sharing a peek at the new rug. I'm really digging how it's all coming together! To kick things off, I want to show you the other side of the room that I've kept under wraps until now - the side with the dresser. Since it was the lead image for this post, let's chat about it first! If you've been following along from the beginning, you might remember that this antique tallboy dresser was the only thing that stayed in this room from the "before" photos. It belonged to my grandparents and it's one of my absolute favorite pieces - imperfections and all. You can see that there are chips in the veneer and honestly, the drawers aren't in the best shape, but that makes it great for a guest room where it's not used all that often! The size is perfect for this little spot and I love the lived-in feel it adds to this little room. To give this side of the room that eclectic modern farmhouse look I'm going for, I wanted to bring in something a little unexpected and modern - cue the Whexis hexagon mirror! * It's from Holly & Martin, one of my sponsors for this challenge and a brand I've loved working with over the past year or so. They have such a great collection of modern decor at really affordable prices. If you're not familiar with them, you should check them out! You can find their products on places like Wayfair, Overstock, The Mine, and Hayneedle. The mirror is large and in-charge, and I love the black and champagne gold frame. It also ties in so nicely with the new pendant light fixture (you can catch a peek of that in Week 4's post). The next update I want to share is the new rug from Mohawk Flooring! Finding the right rug for this room was a big challenge and I've gotta say, they saved the day. With the blue-green floral wallpaper being such an attention hog (in a good way! ), I needed a rug that was simple, but had some structure to it. The folks at Mohawk worked with me to design a custom-bound rug with their SmartStrand carpet and it's awesome for this room. I want to give them a huge thank you for sponsoring this piece! If you're unfamiliar, a custom-bound rug is made from wall-to-wall carpet - the edges are finished off ("bound") to create an area rug. They're a fantastic option for spaces that need non-standard size rug. I loved being able to measure my space and get the exact size I needed, which in this case, was a 6'x9'. I realize that's a pretty standard rug size, but I had a hard time finding one that was the right style and the right size, so a custom-bound rug was a wonderful way to solve that problem! Another thing I love about this rug? It's virtually indestructible! The SmartStrand fibers offer unbeatable spill protection, permanent stain resistance, and long-lasting durability. I have a feeling this is a rug we'll have for a good, long time. Mohawk has a really wide selection of colors and styles too - I chose Enduring Qualities in Bay Blue to complement the blue hues in other pieces in the room. The grid pattern adds really nice texture and structure without competing with the wallpaper. Finally, I just want to mention briefly that I picked up the marble tops I had made for the nightstands this week! I'm so glad I bit the bullet and decided to go for it as a solution to the sorry state of the existing tops. Here's a peek at what they look like! So that'll do it for the final progress week here with the One Room Challenge! My to do list is getting shorter and shorter, and I just have a few items to check off before I can style and shoot it for the final reveal next Thursday. I can't wait! In the meantime, be sure to follow along on IG Stories - I'll probably be sharing a last sneak peek or two over there! Welcome to Week 4 of the One Room Challenge! We're more than halfway through this six week challenge - I can't believe it! This week, I've got a few updates to share with you about window treatments, a lumbar pillow, and a new light fixture. We're chugging right along! Before we dive into this week's progress, I've got an update to share with you about the nightstand conundrum I talked about last week. I made a decision on what to do with the damaged tops: I'm having new ones made with marble! This option was a clear crowd favorite and was definitely mine too. It ain't cheap, but I think it will be worth it to bring some serious style to these vintage mid-century guys. I went to a local stone yard yesterday and picked out my Carrara marble remnant to have fabricated into two matching pieces. They're going to be stunning, y'all. I can't wait to show you! All right, now onto this week's progress. Let's start with the new window treatments! With the way the bump out ends, I'm left with a 7" piece of wall between it and the window trim, and on the other side of the window, the trim sits pretty much right up against the corner. So obviously, this means the window isn't centered on the wall, but, it does mean I could add a single curtain panel on one side thanks to the 7" piece of wall (hooray!). I also decided that I wanted to give this one window a layered look by adding a natural woven roman shade*. I love the idea of layering window treatments - it not only looks beautiful, but it adds function too. Our guests can lower the woven shade for privacy and still allow light to filter in during the day, and at night, they can use both, which creates a nice, dark room for sleeping. Let's take a look at this newly dressed window! I'm loving all the texture and movement with the woven shade and the curtain, but it's also simple, which is good considering it's next to that bold floral wallpaper! Let's chat about that awesome fabric! A big thanks to one of my fabulous sponsors, Calico, for sending this gorgeous fabric my way. It's the Pizzelle Navy fabric from the Vern Yip collection, and I put my sewing skills to work to stitch up that curtain panel. I hung it on a French return drapery rod and these curtain rings. On a side note, both descriptions say they're oil rubbed bronze or bronze, but they definitely fall on the more black side. That's what I wanted, but just thought I'd let you know! Creating a curtain that was completely custom to my window was a first for me, and I'm glad to report it wasn't hard! All you have to be able to do is sew a few really long, straight lines and you're good to go. It's a little bit hard to see the detail of the fabric from the zoomed out photo, so take a look at the two photos below of the zoomed in view and a shot of it semi-closed. It's a striped fabric, but the lighter stripes look like they're space-dyed, which I love. It's a little detail that adds so much and it gives the bold stripe a bit of softness. Here's a shot where you get a good view of what it looks like all together with the floral wallpaper. It's a masculine-meets-feminine moment and I'm digging the way they complement each other! Moving onto the next item on our list - the indigo lumbar pillow! It also happens to be another easy sewing project I took on. You caught glimpses of it in last week's post, but this time you get to see the whole thing! Indigo pillows are so hot right now (ha!) and while I've used them for clients, I've never had one in my own home...until now. I happened to have a yard of indigo fabric that was perfectly sized for a 16x28 lumbar pillow (you can find the insert I used here) and I knew the pattern would work nicely with the floral wallpaper, so off to my sewing machine I went! I definitely like the pillow as is, but I'm wondering if it needs a little something extra. I'm considering adding tassels to the corners - what do y'all think? Finally, let's zoom out and get to the last piece of progress in the room this week - the new pendant light! A huge thank you to another one of my sponsors, Lamps Plus, for this new light fixture! I wanted something that was subtle, but unique, and made you take a second look. This cut glass pendant with its brass and black touches was just the ticket. I couldn't really capture it well on camera, but when the light is on, it casts the most beautiful fragmented light thanks to the cut glass shade. It also coordinates really well with the mirror I haven't showed you yet (next week!). If you love this pendant too, you can purchase it directly from Lamps Plus or from Amazon! Here's the link. I'll be back next week with more progress! In the meantime, be sure to follow along on IG Stories - I'll be sharing sneak peeks periodically over there!